Found 8 file extension associations related to Worms Armageddon and 7 file formats developed specifically for use with Worms Armageddon. ARMAGEDDON: The last battle between GOOD and EVIL on the day of judgment. WORMS: Sneaky little blighters with a bad attitude who couldn't care less about any day, let alone the last one! Now, open a new can of Worms! It's the biggest, it's the best. And it's packed full of goodies (and baddies!) Whether it's Single Player, Multi-player or slithering across the Internet, Worms Armageddon includes a multitude of features and play modes. This is the peak of perfection in ultra-fun. THE BEST WORMS GAME EVER. 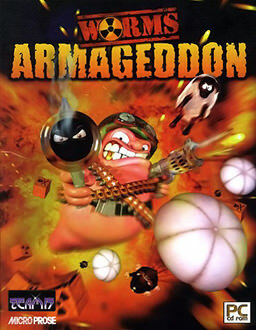 Worms Armageddon enhances the original award-winning gameplay with barmy new weapons, game-enhancing new features and much improved single and multi-player gaming modes. Experience the worldwide IRC-style network WormNET, which makes playing online easier and more accessible. If you need more information please contact the developers of Worms Armageddon (Team17 Software Limited), or check out their product website.